If you have a rocky crawlspace in which you will be storing things and walking around, thicker is the smartest way to go. The thing about a crawl space is that you don't want to get it wrong the first time. You don't want to be sitting in your home after the job is completed and smell that awful musty smell that you had before the crawl space liner/ vapor barrier was installed. Whether you do the job yourself, or hire someone to do it, its a job that you only want to do once. Select the strongest, most tear resistant crawl space liner you can, and sleep well at night. A 20 mil string reinforced liner that passes the essential tests is your go to liner in many cases. Part of the assessment revolves around how you will handle radon. There are liners that block radon. Water Vapor Transmission Rate (WVTR) test ASTM E 96 measures the water vapor transmission rate, or the rate at which water passes through the plastic sheeting vapor barrier. Elongation, Tongue Tear, Trapezoidal Tear and Load Yield are other tests that can tell you how strong the liner is under pressure. 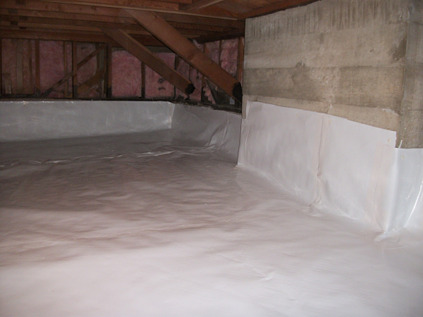 Be sure to ask your installer, or plastic sheeting supplier for this information so you can make an educated decision about which crawl space liner you want to use. What should you know about crawl space liners? 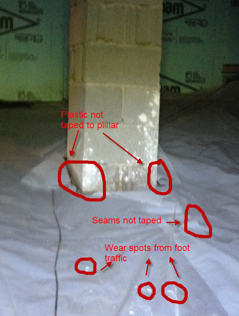 The material that makes up the crawl space line make a huge difference in how well the vapor barrier will do its job. It is key that the liner you select, regardless of the thickness be made from high-grade raw materials- i.e. virgin polyethylene. There are plenty of so-called "vapor barriers" on the market that are made from what is known as "Construction Grade Films" or C & A films. These plastic sheeting products are made with low-grade resins that consist of post-consumer recycles materials. The recycled plastic will not do the job that a crawl space liner that is made of quality resin will do. A so called, "commodity film" has its purpose in agriculture and on a construction site to cover piles of dirt or machinery- but not to stop the moisture and gases from entering your crawlspace. With the goal of one and done- One crawl space vapor barrier and never again have to do this job, the crawl space liners that are made from sub-par plastic or C & A poly AKA Visqueen will decay. The life span of a strong crawl space vapor retarder will resist decay and the attacks from moisture, organisms in the soil and chemicals. Weaker films will come apart and degrade over time. I would like to use reinforced virgin polyethylene, may I provide the plastic to install? The best bet is to do your homework so you can decide if a lighter 10 mil crawl space liner will do the job, or something heavier such as a 20 mil liner. Knowing that there are certificates/ spec sheets that spell out how the liner is rated will insure you are getting what you are looking for. If you need further assistance, we hope you will call us at 760.597.9298. Here's to your beautiful clean crawl space!